Now I'm no dermatologist, but in my opinion, healthy skin is hydrated skin. I've already shared the skincare routine I use to fight the occasional breakout. If you have sensitive skin like me, products with salicylic acid can be drying for your skin, so I like to alternate my acne prevention products with hydrating products. There's nothing worse than having big patches of rough, dry, peeling skin. It happens to me every winter - when the temperature gets colder, I get a nice big patch of dry skin on my forehead and occasionally around my nose/chin/mouth area. I used to just deal with it, because I can't stand the feeling that oily (yet moisturizing) lotion leaves behind. 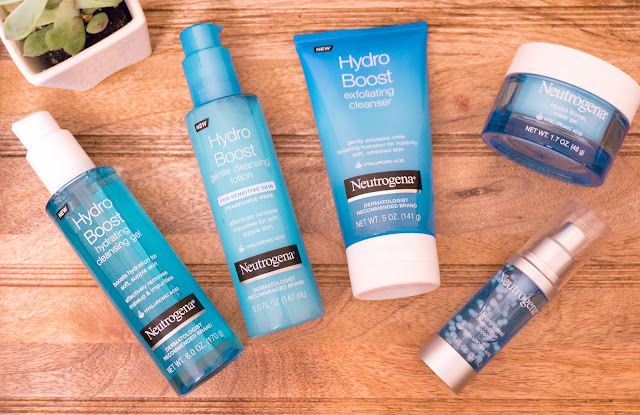 When Neutrogena sent me their Hydro Boost products to test out, I fell in love. I'm not just saying this because they sent them to me, these products are good, y'all. If you're like me and want hydrated skin without feeling like your face could easily serve as a Slip 'N Slide, then trust me on this. The cleansers are good, but the gold is in the Hydro Boost Water Gel and Multivitamin Booster. If you read part 1 of my skincare routine, you know I've been cleansing my face in the mornings with the Neutrogena Acne Proofing cleansers. After I get out of the shower, I've been applying either the Hyrdo Boost Water Gel or the Multivitamin Booster. This leaves my skin so hydrated, plump, and most importantly, NOT oily. The price tag on these two products is a tad bit higher than a normal drugstore moisturizer, but the quality of the products is much better in my opinion, making it totally worth it! Are you a thick moisturizer gal? Have you tried a gel creme? I'd love to hear what you use to keep your skin healthy and hydrated!